Discrimination and Harassment Based on National Origin and Ethnicity are illegal. If you believe that your employer treats you differently because of where you were born, the country of your national origin, or your ethnicity, it is possible that you may have a claim for discrimination. Ethnic Discrimination may occur in any type of job description at any level of pay, in terms of not promoting you, unequal pay, not offering you the same opportunities and benefits as other employees, being treated differently in terms of the quality and conditions of your work environment, job assignments, and wrongful termination. Workers who are immigrants may believe they have no rights under discrimination laws, but immigrant workers do have rights. Blue-collar service industries such as restaurants and landscaping services frequently may have a higher proportion of workers who are immigrants than do business offices. Immigrant workers in these settings may not realize their employer is discriminating against them based on their National Origin or their ethnicity, if the practice is wide-spread. The discrimination may be obvious such as unequal pay to employees of a certain ethnicity or who have a certain national origin. The discrimination may be in the form of not allowing persons of a certain ethnicity or who have a certain national origin, in higher paying positions, positions of more responsibility, positions in upper management. Discrimination based on national origin or ethnicity may be more subtle. These disparities may occur in any type of job description. Ethnic Harassment and Harassment based on National Origin includes overt acts such as using ethnic epithets, or an employer's allowing the use of such epithets by other co-workers, insensitive jokes, and more subtle hostile acts such as being treated differently in terms of the quality of the work environment that creates a hostile work environment. Ethnic Harassment and discrimination can also occur because the worker is in a relationship with one of another National Origin or Ethnicity, such as an employee being harassed because she is married to, dates or has a biological child with a person who was born in Africa. 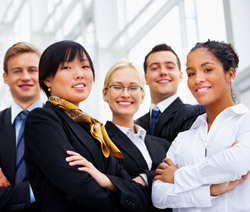 If you complained about Ethnic or National Origin Discrimination or harassment by your employer or other co-workers, and then you were demoted, terminated, or retaliated against in terms of the quality and conditions of your work environment or job assignments, such as by having your hours cut or your pay reduced or your being assigned to less desirable shifts or positions, you may have a valid claim for illegal retaliation for exercising your civil rights. (201) 599‑9600 with your employment discrimination questions today.